Building Performance Simulation (BPS) is a powerful tool to estimate and reduce building energy consumption at the design stage. However, the true potential of BPS remains unrealized if trial and error simulation methods are practiced to identify combinations of parameters to reduce energy use of design alternatives. Optimization algorithms coupled with BPS is a process-orientated tool which identifies optimal building configurations using conflicting performance indicators. However, the application of optimization approaches to building design is not common practice due to time and computation requirements. This paper proposes a hybrid evolutionary algorithm which uses information gained during previous simulations to expedite and improve algorithm convergence using targeted deterministic searches. 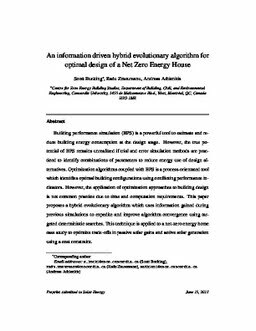 This technique is applied to a net-zero energy home case study to optimize trade-offs in passive solar gains and active solar generation using a cost constraint.